Working and playing with computers can be exciting and lots of fun. Surfing the Web, communicating with email, playing online games, and much more, make computers increasingly popular. At the same time, however there are many things about working with computers that are repetitious. Launching programs, typing in passwords, signatures, addresses, visiting the same web site over and over...and lots more. Whether you use a computer a little or a lot, you spend a fair amount of time doing some things over and over again. 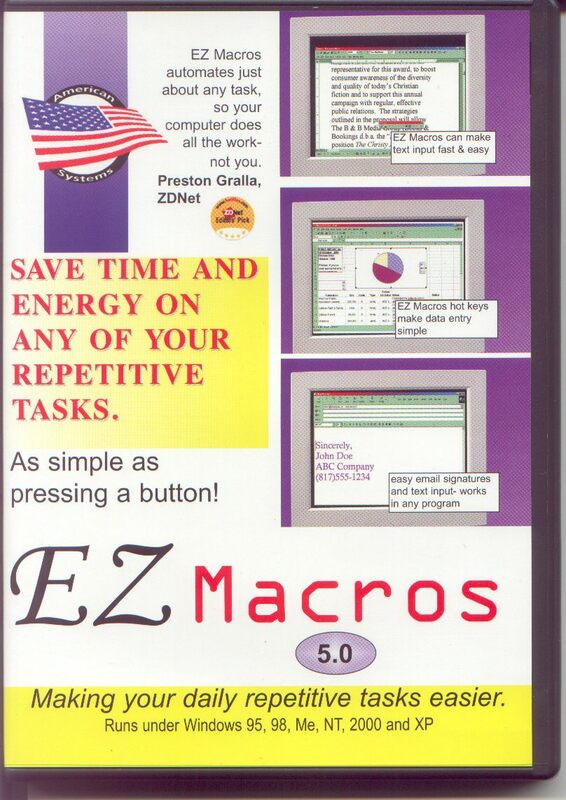 Repetition is unavoidable, but you can get around it with EZ Macros from American Systems. EZ Macros 5.2 is the ultimate keyboard macro utility and now it has even more features. The intuitive interface makes EZ Macros the perfect tool for both new and experienced users. It can "record" keystrokes and/or mouse movements or macros can be created and edited manually. You can automate tasks with just a few keystrokes and hundreds of possible macro hot keys are available. EZ Macros features both global and program-specific macros. "Global" macros can be used with all your programs, while "program-specific" macros work only with particular programs. Tired of typing in the date on documents? Just create a macro that puts the date in for you. Find yourself always using the same 3 programs on a certain project? Create a macro that launches all of them with a simple keystroke! When you create or edit a macro, EZ Macros lets you insert pauses, delays, sounds, date, time, and more! With the FREE companion program, EZ Scheduler, macros can be scheduled to run at Windows startup, once, hourly, daily, weekly, and monthly. On the Internet you can launch your email program or go to your favorite web sites by hitting a simple keystroke. With so many computers in use, in both home and business settings, many people are concerned about security. EZ Macros has that covered too! You can create "secure" macros. A secure macro is protected by a password issued by you, and once secured, no one can see the keystrokes that activate a secure macro. In addition, secure macros can only be edited, deleted, or scheduled by you. So, if you're getting tired of doing the same things over and over, try EZ Macros. Make macros for all those repetitive things and simplify your life by doing them with simple keystrokes! Create Menus of your macros. You can set up a macro to display a list of other macros to pick from when you hit your hot key. For example you may have several email signatures depending on whether you send email to your family, coworkers or your boss. Hit a hot key...display a menu of signatures...click on it. And that's it! Convert your macro to an EXE. Do you have friends or family that depend on you to help them when they have computer problems? This feature will let you create a macro on your PC and convert it to an EXE. You can then send that EXE to anyone and they can run your macro. Converting a macro to an EXE is also great for people who play games. Once you've pioneered a certain phase of a game, convert it to an EXE and send it to your friends. They'll sing your praises! Find yourself always using the same 3 programs on a certain project? Create a macro that launches all of them with a simple keystroke! 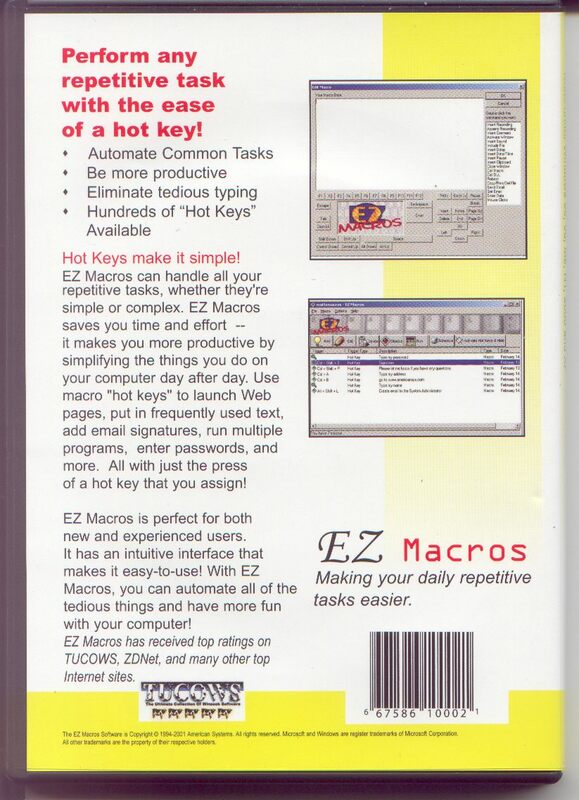 With EZ Macros you can "record" a macro, letting the program capture everything you do, from typing to mouse movements. You can also create a macro manually. EZ Macros lets you create "global" macros that can be used with all your programs. It also lets you create "program-specific" macros that work with particular programs. The playback speed can be adjusted so a macro plays back at the speed it was recorded, faster or slower. When you create or edit a macro, EZ Macros lets you insert pauses, delays, sounds, date/time, and more! Type-A-Macro function lets macros be assigned to an unlimited number of alphanumeric patterns, allowing for the insertion of large bodies of text, launching of programs, and more. Enter Data function pauses a macro so you can insert text, making it excellent for creating personalized form letters. Macros to restart, reboot, or logoff of Windows. Expanded repeat function gives the ability to repeat a macro a specific number of times, forever until it is stopped, or for a specified period of time. Tired of typing in the date on documents? Just create a macro that puts the date in for you. Hit the hot key and voila! There's the date. With the FREE companion program, EZ Scheduler, macros can be scheduled to run at Windows startup, once, hourly, daily, weekly, monthly and yearly. EZ Macros also comes with LiveUpdate technology so you can always have the most current version.